Beau Fisher – Tight Lines from Vortex SurfSkateSnow on Vimeo. Local lad Beau Fisher with part of his run in the 2016 Tight Lines Comp at Thredbo. Above are the mountain resorts we love. For more information about these resorts and accommodation come in store and grab a brochure, trail map and some great advice. Vortex – Suginohara Japan from Vortex SurfSkateSnow on Vimeo. Japan is fast becoming a favorite snow destination for Australians. With its amazing powder snow, friendly people, incredible food and culture, close proximity and affordability it’s not hard to figure out why! With firsthand knowledge of over twenty five Japanese resorts and extensive travel throughout the country, Vortex staff can help you have a Snowboarding trip of a lifetime. 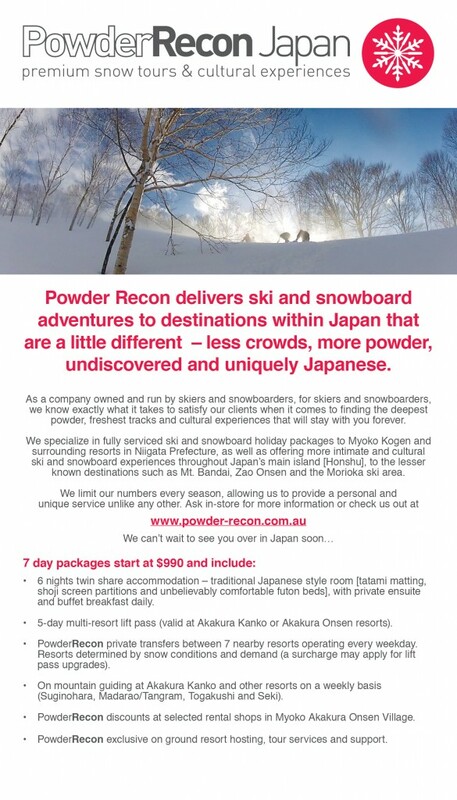 For details contact us at info@vortexsurfskatesnow.com.au or check out www.powder-recon.com.au. See Jan/ Feb 2012 action in the GoPro 2 video footage on SNOW GALLERY. Vortex are now your one stop shop for snow gear with a great range of boards, boots, bindings, outerwear and accessories from the biggest names in the industry, like BURTON, DC, NITRO, UNION, GNU, LIB TECH, DAKINE, DRAGON, ELECTRIC, ANON, O&E, XTM and more. Check out our package deals on complete board, binding, boots and board bags for great value for money. Rental gear has also been amped up this year, we have a stack of new rental boards, boots, clothing, après boots, wheel chains and even toboggans to hire so don’t waste your valuable boarding time getting messed around on the mountain, come in to Vortex and get everything you need the day before your trip. If you own a board we can fully service it, with waxing, edge tuning, base repairs & grinding all at resonable prices. Come in to vortex now for all your snow gear and advice, you won’t be disappointed! If you can’t find us in the shop chances are we’re at one of….